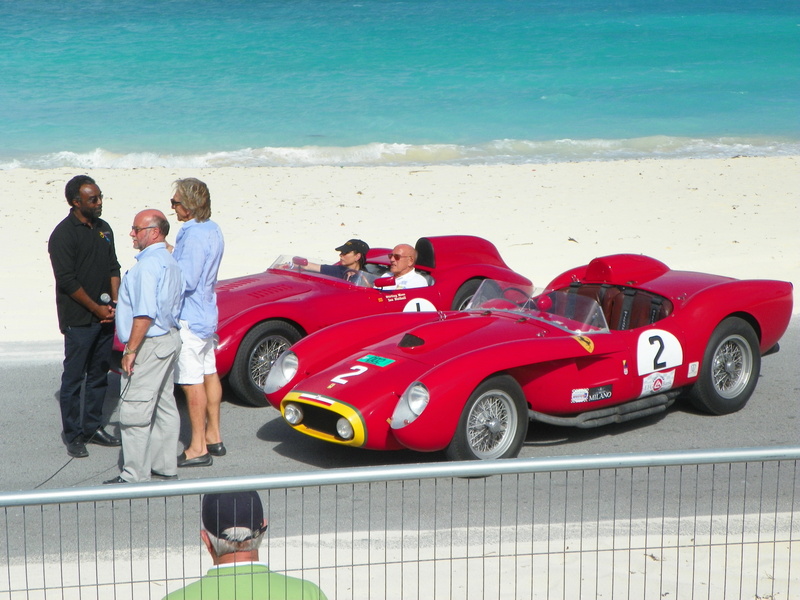 The First Bahamas Speed Week Revival, staged last week, was not only a success in its own right but has laid the foundations for much more in 2012. This photograph of Sir Stirling Moss, cool in period sunglasses, sitting in his own OSCA on the start line of the Arawak Cay Sprint Circuit, just about says it all. The light is the thing – that Caribbean light. And the contrast – that weaponry so exquisitely out of context. Next to Stirl sits a Ferrari Testarossa, while a spritely-looking Derek Bell chats to the Minister of Tourism for the Bahamas, Vincent Vanderpool-Wallace. Their conversation? David McLaughlin, the man behind the Bahamas Speed Week Revival – listening-in here! – tells me it was about Vincent’s vision of a permanent site for a temporary circuit (if you see what I mean) out there on the Cay itself, surrounded by the harbour and all that comes with it.